Mekong’s reception area is almost as big as the Anantara hotel lobby. There was an empty canoe styled reception desk, empty bird cage ceiling installation, empty chairs that looked like they were borrowed from The People’s Great Hall in Beijing and the whole foyer remained empty for several long minutes. The hostess arrived briefly, gave me a quick smile, took the reservation name and promptly disappeared again. 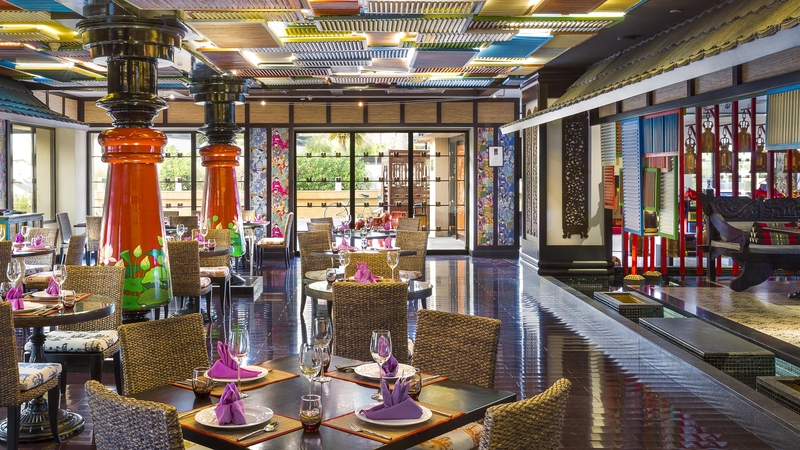 Mekong is Anantara’s Pan Asian restaurant, down at the end of The Palm crescent. It’s further than you think and is quite a commitment for dinner. Mekong has been open for a few years now, so my apologies for not being particularly cutting edge with the review. The Serb chose the venue. Mekong celebrates cuisine from Asia, namely Thai, Vietnam, and China. After our hostess finally got back from her unexplained trip, she walked us to our table and handed us about four kilos of menus to look at. 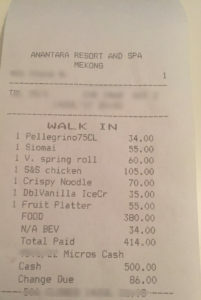 Typical of a hotel outlet – beverage menu, wine menu, food menu, dessert menu. A menu of all the menus. The list is endless. The room layout is rather confusing – faux canopies attempting to create a sense of outdoors, indoors. But they didn’t make sense, in the same way, a M.C Escher drawing doesn’t make sense. Mekong is super themed, and if you ever forgot that you’re in a Pan Asian restaurant, the décor will constantly remind you. Constantly. It will be etched into your soul, forever. 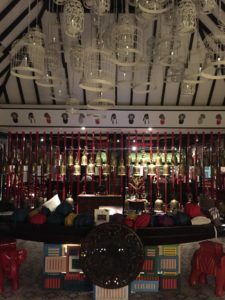 Red lanterns, Chinese calligraphy, tuk tuk tables, floating lilies, paper umbrellas, tiger murals and Ming vases – Mekong has stuffed it all in there. I am surprised they had room for a kitchen. The main dining room is surrounded by what is effectively a moat – great for keeping away invading armies and checking horse and cart deliveries but not so friendly towards waiters with shoulder-high trays. Needless to say, they all moved with a finesse and speed that would make Michael Flatley proud. 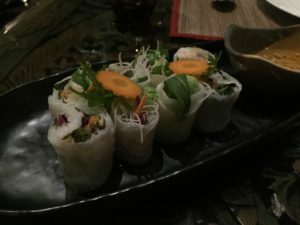 We ordered our food – I went with a Vietnamese spring roll, remembering my last one was from some restaurant in Dong Khoi, in Ho Chi Minh City and was excellent. I also ordered the Siomai, the chicken dim sum. 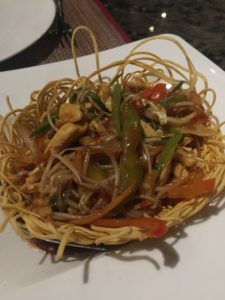 For mains, I went with the crispy noodle, and the Serb ordered the sweet and sour chicken, probably because she recognized it from the Hengchen take away menu we have on the fridge at home. Plus, sweet and sour chicken is what she always orders when we eat anywhere vaguely Asian. Either that or duck. Our server was efficient and assertive. When I added a dim sum platter to the food order as an afterthought, there was an audible tut and an explanation that the platter had 127 dim sum in it. I don’t know if she was implying that I wouldn’t be able to finish it, or I shouldn’t finish it. Either way, she had the assuredness of a former madam in a rowdy Shanghai tea shop. She seemed in control, quite knowledgeable and not scared to throw you out if you order too many dim sum. But in a very nice way. The room has its good points – there are some attractive feature walls with retro Chinese wall paper, and the corridor to the bathrooms is particularly worthy of an Instagram post – which, by the way, I don’t recommend you try. You look extremely suspicious taking pictures, especially if a group of ladies come out of the bathroom at the same time. Apparently. A friend told me. As we waited for the food to arrive, they bought us out the Pan Asian equivalent of bread sticks. A bunch of dark green leaves and some fillings to go inside. Peanuts, lemongrass, onions, ginger, lawn clippings, things like that. As I crunched into the stuffed leaf, I had visions of how our ancestral foragers must have lived. If they lived in a heavily themed Chinese restaurant. With a moat. Having said that, as leaves go, it was quite delicious – the flavours were punchy, and the crunch was satisfying. Because we were seated in one of Escher’s terraces, the seating area next to us was elevated, and I had a wonderful view of everyone’s legs for the duration of the meal. The main demographic of the restaurant were tourists – families on summer break, kids playing on their ipads, mums wondering why on earth they came to Dubai in July and dads thankful that the family suite was on special offer. It only struck me half way through the evening that there was no music playing. The only sound was the hollow chat of other guests and the occasional splash as someone fell into the defensive moat. The lack of music hadn’t bothered me until I realised. Then it bothered me a lot. Every restaurant needs music. Except for wagamama. like a sunburnt Scotsman in the dead sea. Our dim sum and Vietnamese spring roll arrived. Usually, Vietnamese spring rolls use wafer thin rice paper, so fine and delicate that they are almost translucent. Mekong’s rice paper was of the thick-cut variety. It was rice cardboard, which made it chewy and rubbery. Also, the roll itself lacked any sort of seasoning or flavour, relying solely on the dipping sauce to provide the much-needed taste. Very average and quite disappointing. The chicken siomai was good – the chicken was flavourful, but I didn’t get the impression they were made in house. I could be wrong. After what seemed like quite a wait, our mains arrived. 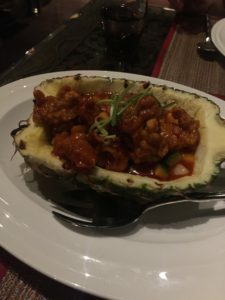 The sweet and sour chicken was presented in half a pineapple, just like the Chinese do it. In Hawaii. In the eighties. It was slick, sticky and piping hot. The chicken pieces floated on top of a thick, viscous sauce like a sunburnt Scotsman in the dead sea. According to the Serb, it was better than our usual take away because it had pomegranate and she appreciated the pineapple. There you go. My crispy noodles were good – a little salty with some overly aggressive noodle strands that almost took my eye out. But I persevered and enjoyed them. The key is to drown the crispy noodle parts in the sauce until they soften up. However, that takes patience – something I severely lack. I deserved the noodle in the eye. Mekong is an average hotel restaurant. The décor is memorable, but the food somewhat forgettable. The price, however, was good value for money. But what do I know – Time Out awarded them Best Asian restaurant of 2016, so they must be doing something right.